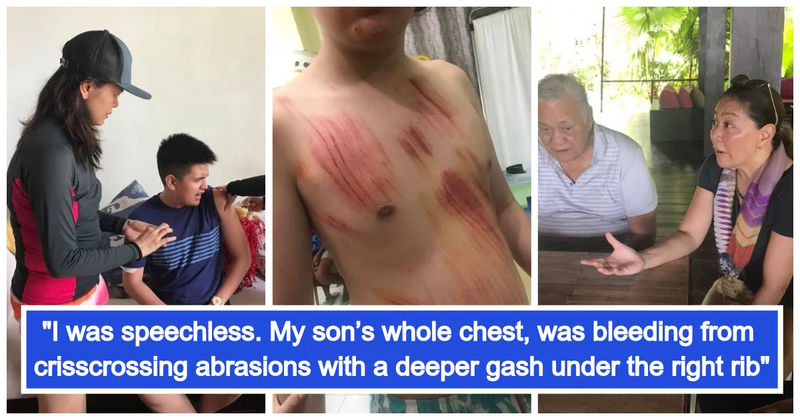 Home / News / Trending / Karen Davila son’s surfing accident leads to frightening realization, Siargao is a DANGER to tourists! Karen Davila son’s surfing accident leads to frightening realization, Siargao is a DANGER to tourists! The now-booming surfing destination Siargao has proven itself to be a new found love of many foreign and local tourists. An island that is notorious for having white sand beaches, pristine waters and world class waves that Boracay Island lacked, Siargao is a legitimate paradise. Such a reputation can catch the curiosity of the most famous of celebrities and media entities, and catch it did with ABS-CBN news anchor Karen Davila who shared an unexpectedly horrifying experience in Siargao on Facebook, where the life of her child was put in danger due to the tourist destination’s lack thereof initiative and care for the tourist’s safety. Davila narrates her experience, arriving at March 28, 2018 with her husband DJ Sta. Ana and her two little boys, David and Lucas. Everything was going well and the entire family was excited to have the Siargao’s Cloud-9. And indeed they did, the resort that Davila’s family was staying in, called Isla Cabana, contacted a seasoned surfing instructor named Junrey Taoy who was going to train the kids to surf with his friend Jocol Valerio while the couple bask in the beach. At 4pm, the kids under went training, with Lucas under Taoy’s supervision and David under Valerio’s supervision. Despite the trust that Davila bestowed upon the surfing instructors, she reminded Valerio that David may be sporty and trains regularly, he still has special needs. To which the instructor understood clearly and belittled stating that “madali lang yan, kaya yan”. The kids were to surf at Boardwalk Cloud-9 beginner’s area called Jacking Horse, with the waves strong and the beach crowded with tourists, worry was the last thing on Davila’s mind. Why worry in such a paradise right? Half an hour later, David runs back to his parents, rash guard shredded and blood everywhere. He said that he got into an accident and this was something that Davila could not believe. DJ immediately tried to find a life guard, medic or first aid station throughout the beach, and to no avail did he find one. While Davila frantically started calling out for Lucas, who after a while, went back to shore with his instructor. David’s entire chest was covered in abrasions and scratches, causing him to bleed from horridly. And disappointingly, after Valerio was asked to get first-aid supplies from the sarisari store, he disappeared. It took a couple of minutes later until the Isla Cabana resort owners arrived at the scene with their van. Dingdong and Mildred Pabillore probably got wind of the accident through local chitchat and arrived as soon as they could. But the problem was that the nearest hospital was 45 minutes away by car. When the family got to the municipal hospital, to their remorse the vaccines needed to prevent tetanus were unavailable. Unbelievably, the patient’s attendees themselves must buy the tetanus vaccines. With other foreigners in the Emergency Room and the lack thereof medicine and first aid, Siargao sure was a nightmare for them too. It was more than disappointing to Karen Davila for the island had no course of action in case some tourist gets into an accident. Siargao is a rising tourist destination with visits expected to increase in coming months. So why didn’t the local government set up at least one first aid station by the boardwalk? What a humiliation! Karen Davila met with the Jaime Rusillon, the Mayof of General Luna. She raised points of concern regarding the tourist destination that can be used as points of improvement. “1. I found out anybody who surfs in Siargao can train in Siargao. Some of the trainers are habal habal drivers, who train on the side for extra income. The instructors have no professional certifications. No requirement to be certified. No system of vetting trainers. Anybody with a surf board, who wants to earn P500 an hour can train. Period. 2. There are NO LIFE GUARDS on the beach. NOT ONE. This is crazy. The rising mecca of surfing, with hundreds in the water - and NOT ONE life guard to save tourists from possible drowning or injury. 3. There is NO FIRST AID CLINIC or trained medical personnel at the beach. NONE. Sari-sari stores sell Betadine, alcohol, cotton, gauze, tape - proof that injuries are quite common, with supply meeting demand. Problem is, they are able to sell the first aid meds but essentially don’t know who to assist you. In other words, “bahala ka na sa buhay mo”. She argues that accidents are a common thing in extreme sports but the lack of safety measure and first responders concerns her. On top of that, Taoy, the surfing instructor stated that Jocol was not able to bring David further out, this could’ve which prevented the accident in the first place for the further away you are from the shoreline, the further away you become from the rocks. “Karen, were a 5th class municipality and we lack doctors, and we are not ready for the influx of tourists, we were shocked,” the Mayor stated. Davila, being a well-informed journalist, was not impressed at all. Her extensive knowledge on the 1.2 billion peso allocation for Siargao’s infrastructure was rubbed into the face of the mayor. With that a small lump of that money, the municipality can train every local in Siargao to be a life guard and still be able to put up a small first aid clinic. “Karen let me invite you to the Surfing competition this September, ayun, maraming nurse and life guard na ron, kompleto”. Davila did the talking with other resort owners, it is true that the resorts are on their own and that the Local Government Units (LGU) were useless. Despite being dependent on the profits that Siargao’s tourism brings in, neither the resort owners nor the LGUs were doing anything to bring immediate safety or medical attention to the tourists. This prompted her to shout out concerns on the lack of safety measures and first responders of the beaches of Siargao and the direly needed professionalization of the surfing instructors to the Department of Tourism. But despite it being a horrible traumatic and horrible experience, the journalist was still grateful for the safety of his family. He may got into an accident, but the most important thing is that he is still breathing, alive and well. Davila and her family extends her thanks to all those who helped, doctors, nurses and locals who provided assistance and remained by their side. It was a first time trip to Siargao GONE WRONG. Last March 28, Wednesday, I flew to Siargao with my husband DJ and our two boys, David and Lucas. We were billeted at Isla Cabana, a beautiful resort popular for its white sand beach front. Excited to experience Siargao, I immediately booked surfing lessons for my sons at 4pm, a perfect time for surfing, I was told, for it would be high tide. Isla Cabana contacted Junrey Taoy, a seasoned surfing instructor whom the resort often outsourced for guests. Just a few minutes from the hotel, we rode a tricycle to Boardwalk Cloud 9, lined with motorcycles, surfing boards, surfing dudes and small gifts shops, it leads to the impressive beach which Siargao is becoming world famous for - massive rolling waves for surfing. There are 3 major surfing areas in Cloud 9 - Jacking Horse for beginners, Quicksilver for inermediates and Cloud 9 for experts, where surfing competitions are held every September or October. My kids, ofcourse, trained at Jacking Horse. Waves were still strong. And I have to say, crowded with tourists - foreigners, locals, many with families and small kids. After a few minutes of basic training on the beach, David and Lucas were off with trainers Junrey and Jocol, while my husband and I lay on the shore enjoying the view and the local vibe. Around half an hour after....our son David ran to us BLOODIED, with his rash guard ripped apart and said, “Mom, I had an accident!”. I have to say, I was in a moment of suspended disbelief. My husband immediately attended to my son, as they searched for a life guard, a medic or a small first aid station in Boardwalk Cloud 9. I on the other hand, started calling out for my smaller son, Lucas who was still surfing on the beach. After a minor commotion, with surfers screaming my son’s name, Lucas finally came to shore with his trainer Junrey. It took some time before we finally found David and my husband DJ at the end of the boardwalk. I WAS SPEECHLESS. My son’s whole chest, was bleeding from crisscrossing abrasions (as you can see on the photo above) with a deeper gash under the right rib, clearly from hitting the rocks on the shallow waters, his chin bruised and covered with blood, his right hand in cuts like that from a small knife. What got me very angry was Jocol Valerio, the trainer - suddenly dissappeared! My husband said after showing him the sari sari store where to buy the Betadine, cotton and gauze, he left them. No one was there to assist my husband or my son who was bleeding! No nurse, no first aid, NO ONE. A couple minutes after, the owners of Isla Cabana came with a van, presumably after hearing the news from the locals. Owners Dingdong and Mildred Pabillore offered to drive us to the nearest hospital, which was at Dapa....would you believe, some 45 minutes away by car! Imagine if we had to take a tricycle! At the municipal hospital in Dapa, there were no tetanus vaccines available. Mildred had to ask Junrey, Lucas’ trainer to take his motorcycle and buy Tetanus Toxoid & Tetanus Immunoglobin Vaccines, antibiotics and painkillers prescribed by the doctor. While there was a doctor and a nurse on duty, very helpful and attentive - there were no medicines. Foreigners were at the ER with us and I wondered, how do they attend to so many foreigners visiting the island with this set up? SO THIS WAS OUR FIRST DAY IN SIARGAO. Major accident involving a minor. No first aid treatment at a busy tourist surfing site. Missing surfing trainer who ran away. Long drive to the hospital, with no medical supplies. The next day, I was able to speak with the Mayor of General Luna, Jaime Rusillon and his daughter Dra Romina Rusillon. They were kind of enough to visit at Kalinaw Restaurant where we were having lunch with some foreign guests who were also in Siargao for the first time. I expressed my concern to the Mayor and raised alarm bells over the set up in Cloud 9. 1. I found out anybody who surfs in Siargao can train in Siargao. Some of the trainers are habal habal drivers, who train on the side for extra income. The instructors have no professional certifications. No requirement to be certified. No system of vetting trainers. Anybody with a surf board, who wants to earn P500 an hour can train. Period. 4. The attitude of some instructors on Cloud 9 is, “ay nasugatan”.... and stare at you like it’s absolutely natural. No panic, no rush, just local chit chat like it happens all the time, and it’s not that big a deal. Safety clearly isn’t top priority. Now, let me make it clear. I am well aware, accidents happen anywhere in the world. Surfing is an extreme sport. But so is skiiing, bungy jumping, paragliding, diving....but accidents can be prevented. And they are in many tourist destinations by putting safety measures and first responders in place. Junrey, Luca’s surfing instructor informed us that Jocol didn’t take David further out to sea, which is safer for beginners as there are no rocks. Clearly, Jocol IS NOT CAPABLE AND TRAINED TO TEACH MINORS. Once a town is SOLD TO TOURISTS, the primary responsibility of both the national and the local government is to ENSURE THE SAFETY OF THE TOURISTS. PERIOD. WHAT?! I’m not going to detail... but wasn’t P1.2 BILLION allocated for Siargao to improve infrastructure to boost tourism? Wasn’t a multi million sports complex built?! All this infra and Siargao can’t afford to professionalize its trainers, put full time first aid clinic and life guard for tourists to support the VERY industry that put it’s name on the map? ANOTHER...WHAT?! I asked him, why not ask the resorts to chip in if you really don’t have the budget? With over 100 resorts in Siargao, imagine at P500 a month per resort, that’s P50,000 for a full time first aid clinic! I spoke with Nino Barbers, one of the owners of Bayud Resort regarding this incident, as he is one of the officers of the Siargao Island Surfers Association and Siargao Tourism Operators Association, and he said, the resorts are basically on their own, with no help of assistance from the LGU. Now, this is ridiculous. Siargao thrives on tourism. Both the LGU and resort owners, businesses are interdependent on the success of the island. I call on the DEPARTMENT OF TOURISM to act on Siargao right away... life guards and first aid clinics at the beach ARE A MUST. AN EVERY DAY RESPONSIBILITY. It’s time we professionalize surfing instructors as they do in other countries. Let’s stop being a backyard operation that may cost the lives of people. Our first visit was traumatic but I remain GRATEFUL. My son is safe, others may not have been so lucky. Thank you to all the doctors, nurses and people who helped us along the way. I want to highlight this so action can be taken before anything worse happens. Hopefully, something good will come out of this for Siargao.